Suspect identified as 33-year-old David Laffer, sources say. An arrest has been made in connection with the pharmacy shootings that claimed the lives of four people on Long Island over the weekend, including a 17-year-old girl who was supposed to graduate this week, police confirmed Wednesday. The suspect, identified as David Laffer, 33, is in custody at police headquarters in Yaphank, law-enforcement sources tell NBC New York. 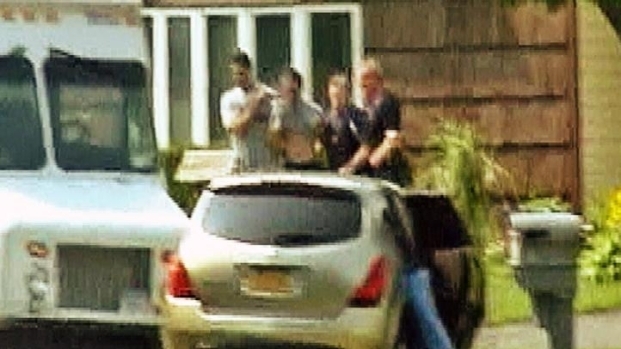 A handcuffed Laffer was led out of his Medford home after cops executed a search warrant at the residence, which is less than three miles from the site of Sunday's bloodbath. Police were led to Laffer by analyzing a drug-sales database. Laffer's wife was also led out of the house in handcuffs. Melinda Brady, 29, has been arrested for third-degree robbery for her involvement. Her arraignment is set for Thursday, Suffolk police said. The same day two families said goodbye to their loved ones, Suffolk County Police arrested the prime suspect in Sunday's quadruple homicide at a pharmacy in Medford. About 30 to 40 officers converged on the home and brought out Laffer, who resembled surveillance photos of the suspected killer, said Peter Spano, who was siding a friend's home down the street as the raid unfolded. Spano told NBC New York he saw SWAT teams descend on the suspect's home "like ninjas." Trish Bohlert lived next door to Laffer for 14 years and attended his wedding about four years ago. She told NBC New York he lost his job at a local warehouse about two weeks ago and that his wife, Melinda, hadn't worked in a few years. Police led a man and a woman out of a home in Medford after executing a search warrant in connection with the pharmacy slayings that happened over the weekend. The arrest comes three days after the bloodshed at Haven Drugs, a family-owned drug store and staple of the Medford community. The homicides shocked the community and spawned a massive manhunt for a gaunt man with a beard wearing glasses and a baseball cap. Police released images of the gunman captured by surveillance video and received hundreds of tips in the 48 hours after the devastating shooting on Sunday. Spano said the "distraught" man taken from the home looked like the suspect in the police photo, except he did not have a beard. "He looked spent. I knew it was him," Spano added. "He looked like a shell of a man." Bohlert told NBC New York she was "shocked" by news of his arrest in connection with the pharmacy shootings. "I couldn't think of him robbing any store, much less killing four people," she said. Suffolk County Police Commissioner Richard Dormer previously called Sunday's killing at the pharmacy "one of the most heinous, brutal crimes we have ever encountered." The victims were shot at very close range by a suspect bent on stealing painkillers, police officials said earlier this week. 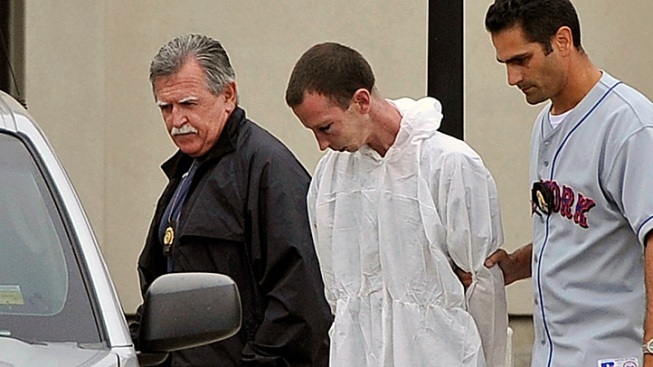 The suspect stole drugs and killed everyone in the shop before fleeing with a black backpack. Police identified the two employees who were killed as pharmacist Raymond Ferguson, 45, of Centereach, and store clerk Jennifer Mejia, 17, of East Patchogue. Two customers were also slain. They were identified as 33-year-old Jamie Taccetta, a mother of two who was set to be married in October, and Bryon Sheffield, 71. A viewing was held Wednesday and Thursday for Mejia, whose high school prom would have been Wednesday evening. 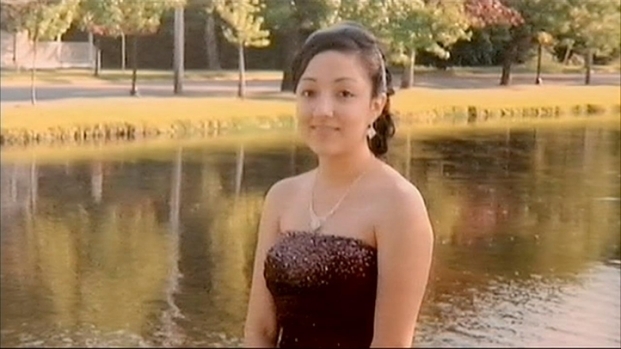 Her classmates took a moment to remember her at the pharmacy on the night she would have been attending her prom. "We will miss her tonight, but I know she would want us to have a good time," a friend said. Her funeral is scheduled for Friday. The funeral services for Ferguson and Taccetta are scheduled for Saturday. Meanwhile, on the same evening, relatives and friends of 45-year-old Raymond Ferguson attended his wake. His wife said she was relieved to know a suspect was in custody, but that the arrest did not relieve the pain of her husband's death. But she said she hoped it meant another family would not have to experience what she was going through. In the aftermath of the shootings, Dormer warned physicians and the owners of small drugstores in the area to be vigilant about anyone "expressing an urgent need for prescription painkillers." He said added police patrols would be deployed near small pharmacies until a suspect is apprehended. A $5,000 reward was offered for any information leading to the arrest of the "extremely dangerous" suspect.